I’ve spoken to several people on my Silver Shadow voyage from Bali to Singapore who share a common sentiment: After getting a taste of Indonesia, they would not want to travel here on land-based vacations. Indeed, having done Indonesia both by land and sea, I am in consensus with those who I have spoken with. Perhaps it is my age (56), but I would find it difficult to tolerate the traffic, the heat and the busyness of Indonesia without the sanctuary of our floating luxury oasis, Silver Shadow. 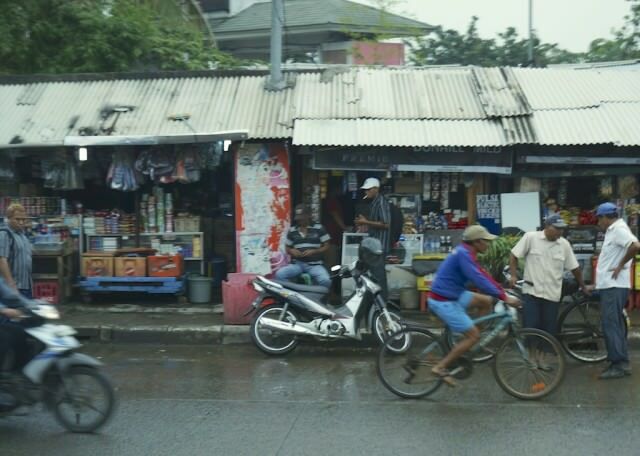 Before coming to this part of the world, travelers should know that Indonesia is an underdeveloped, third-world country. 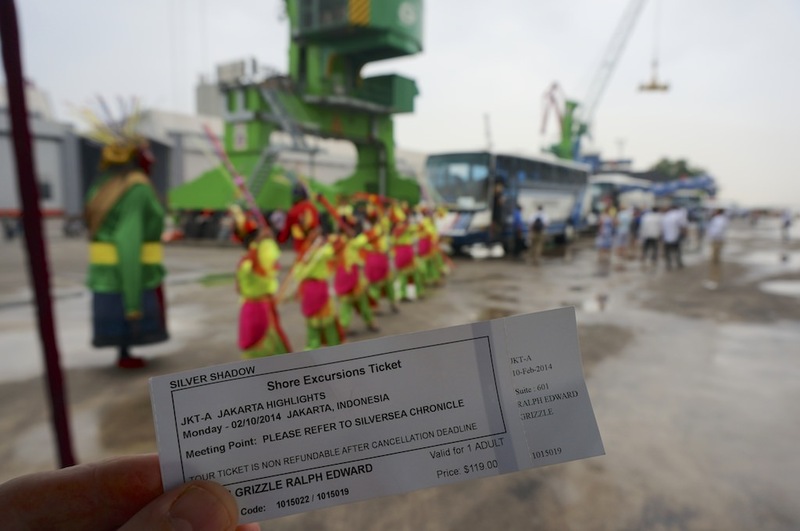 Case in point today, our last full day in Indonesia: As we traveled on motorcoaches, we passed miles of slums to get between the industrial port where Silver Shadow docked and Jakarta’s city center. Our guide told us that some of the people living in the slums exist on nothing more than the garbage that they can collect. The poor live in shanties on dirt streets, partially under water from recent flooding. It is a sad fact of life that there are many poor people here in Southeast Asia. Yet, somehow they survive. We encountered one young man who came up with a clever way to earn money. He stepped into the slow-moving highway traffic and held up his hand to stop oncoming traffic so that transport trucks could merge onto the road. As tokens of their appreciation, the truck drivers handed the boy the equivalent of 25 cents to 50 cents, our guide said. Living in Indonesia requires such innovation just as traveling here requires a bit of fortitude. The results, however, can be rewarding and life-enriching. Unlike so many other places that dot the globe, Indonesia is a place where the there is still there. The country has a distinct and colorful character that is difficult not to appreciate. In fact, the Indonesia I have seen on this voyage has not been unlike the Indonesia I saw nearly three decades ago as a backpacker. Both times, Indonesia enthralled me. It wasn’t all pretty, but this is real life in a real country, and it’s important for those who don’t want to be disappointed to manage expectations. While the archipelago of more than 17,000 islands is culturally rich and endlessly fascinating, it is also a destination where much of the population is mired in the economic doldrums, where highways are less developed than in the Western World, where police escorts may be required to make way for the motorcoaches — and much more that may surprise travelers in some cases and alarm them in other cases. Silversea made travel here extremely easy compared to what it could have been like. I’ll address how Silversea handles shore excursions in tomorrow’s post. Never did we feel threatened or uneasy about our safety. On the contrary, the Indonesians have been friendly, gracious, exceptionally warm and welcoming. I have never seen so many smiling people, despite the hardships of living here, and I’ve rarely seen people whose happiness appeared to run so deeply. As in life, when the traveling is good, we experience the unexpected and the serendipitous. Those qualities contribute to the beauty of the journey and the awareness that comes with visiting places that are unlike those where we live and those where we have traveled in the past. Travel often leaves us more open-minded, more tolerant, more compassionate toward our fellow human beings, than we were before we began our journeys. And often the more we are jolted by journey and the experiences, the better we are for it. I’m all for well-informed world citizens whose eyes have been opened by seeing the reality of how others live on this planet. No matter whether you think travel has a larger role for changing us or whether you believe it is something simply to be enjoyed (or both), you certainly could not have dismissed as uninteresting life beyond the windows of the motorcoach and along the highway today. The initial squalor we encountered eventually gave way to green parks and golf courses and high-rise condominiums, where billboards advertised beautiful views from expansive balconies for those who could afford those promised fabulous vistas. I didn’t see the prices for the high-rise condos, but a comfortable apartment in the city, our guide told us today, can be had for around US$30,000. That gives you an idea of the financial chasm between East and West. 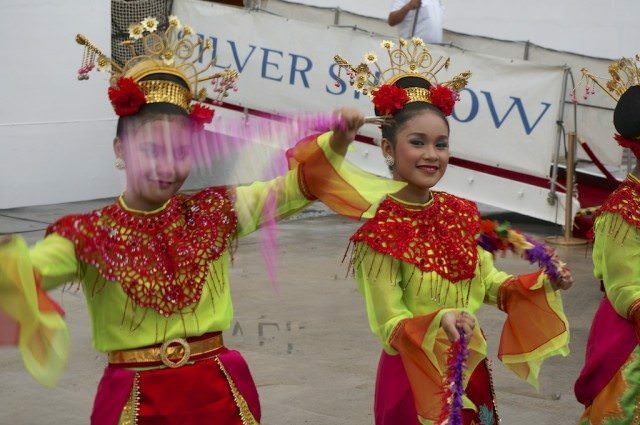 As in the other Indonesian ports we have visited on this voyage, we are learning a lot about the contemporary lifestyle and the native culture and customs. 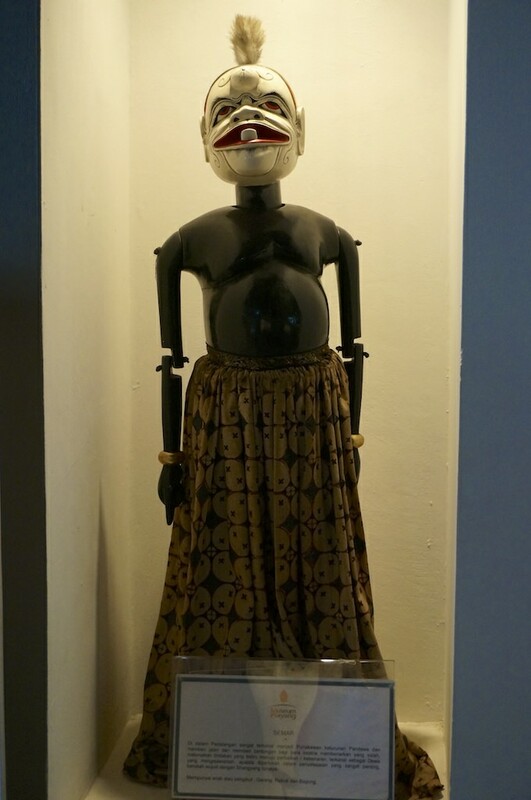 Today, we visited the Museum Wayang, where the Wayang Puppet Theater has been recognized by the United Nations as culturally important to Indonesia’s oral history. And we spent time at the Museum Nasional, Indonesia’s National Museum, where many on my bus said they had wished to spend more than the hour we had to browse artifacts and learn more about life in this island-nation. 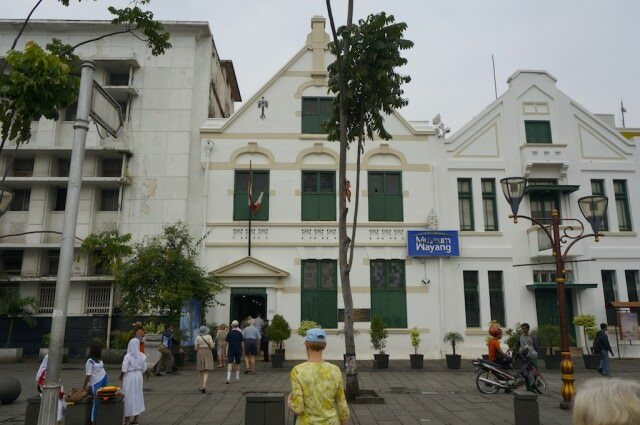 We toured many more city sights on the motorcoach in this huge and sprawling city, which is a mix of modern architecture and Dutch Colonial, with Starbucks on one corner and buildings constructed during the time the Dutch colonized Indonesia on another. Our tour ended at a mall, where we had nearly 90 minutes to shop. I spent 30 minutes browsing in the grocery store on the bottom level where I saw fruits I had never seen and oddly, green bread. 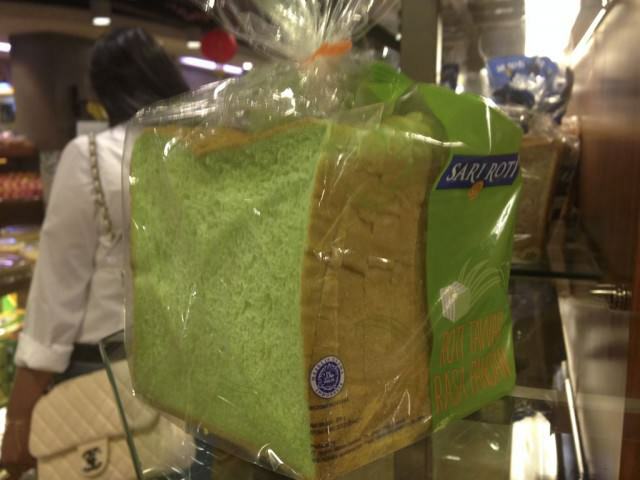 I’m not sure why the bread was green, but I checked: It wasn’t mold. I felt fortunate to be on a floating boutique hotel that took us from port to port in the highest levels of comfort. As I have noted in previous posts during this voyage, I have the services of a butler, and any night I like, I can dine in the only Relais & Chateaux restaurant at sea or in the three other restaurants on Silver Shadow. I can also dine in my suite for breakfast, lunch and dinner. At the end of the day, when we’ve returned from those long tours, there is plentiful champagne to moisten our parched throats. Few, if any, hotels in Indonesia could offer such a high level of service and dining, and none could do so while transporting guests from one place to another. Some travelers (me included) leave Indonesia today wanting even greater immersion than they experienced on this cruise. Silver Shadow gave us a sample of what this destination is all about. Next month, Silversea will introduce a new expedition vessel, Silver Discoverer, and it will offer deeper immersions into the region. I’ll be reporting more about the third expedition ship in Silversea’s fleet when I attend the christening ceremonies in Singapore next month. 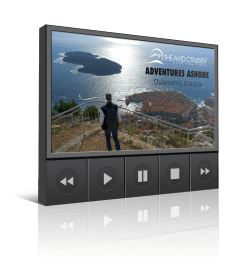 For now, it may interest you to know that Silversea is including roundtrip economy airfare, and reduced business class airfare, for new cruise bookings on select expedition voyages on Silver Discoverer. You’ll need to book by March 31, 2014 to qualify for the air incentives. Having traveled in Indonesia two times now, I encourage those with an interest in seeing these fabled islands not to put off your journeys. You now have a couple of Silversea vessels to take you there in the style and at a level of comfort that make the going easy. If you’re anything like me, you’ll return home a little more enriched than before you left. What more could you ask from any travel experience? The fine wines, fine dining, the expansive suites with butler service, the pool, spa and fitness facilities. 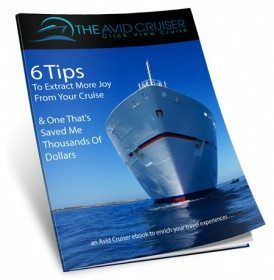 These are all icing on the cake on a voyage that has the potential to broaden your point of view. All you need to do is come with open eyes and open minds.